Asteroid mining at its finest. So, you wanna make some space ships together? 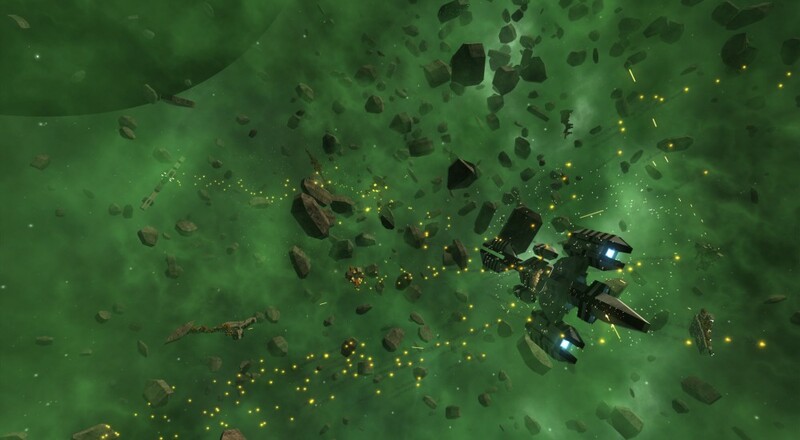 Avorion is a recently Greenlit sandbox game that lets you build a vehicle capable of traversing the great black skies. It's like Minecraft, but with cargo modules, mining lasers, and propulsion engines. The first thing you'll notice about Avorion is its atmosphere. So many space-based games focus on dogfights and explosions. Here, you're presented with calm, soothing music, and an endless empty sky. Ships, stations and asteroids dot the distant horizon, each offering their share of rewards and dangers. Click to plot your course, then fly to your destination. Mine for materials, trade with pirates/factions, and get a little political turmoil rolling to a nice caustic boil. That's what space operas are for, after all! The ship building aspects of Avorion are neatly integrated into the exploration-based gameplay. Blocks can be added via a simple interface, allowing you to shape, place, color and coordinate every aspect of your vessel. Pieces you add directly affect the performance of your ship, as well. If you want more speed, you need more engines, for example. It all adds up to a satisfying feedback loop of create, gather, explore, create. And the best part is you can host your own server and do all of that with 10 or more friends. I mean, 10 or more space friends. Avorion was recently Greenlit and will release on Steam when it's good and ready. For now, a 64-bit demo is available for Windows and Linux. Grab it and see just how enchanting the game can be. Page created in 1.2678 seconds.